The team made it out of the Baltimore heat and is excited to start the Annapolis to Newport tomorrow morning. 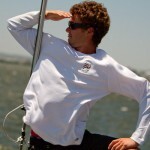 Colin wrote a great description of what working in the yard was like and the team is hungry for ocean racing. We plan to leave Baltimore at 8 tomorrow morning and motor down to Annapolis for a 1:00 start. The Annapolis to Newport Race is 473 miles long. You can track the team during the race.